I've become a convert to exercising in hot water. This is not your rah rah water aerobics class but gentle stretching and relaxing exercises that leave you feeling fantastic. It is particularly good, if like me, you spend too much time hunched over a computer in order to earn your living. And such working conditions seem to be true of most people these days. There are a number of classes in Melbourne in thermal pools such as those at the Hawthorn Aquatic and Leisure Centre and the Ascotvale Leisure Centre . Classes cost between $5 to $10 depending on your eligibility for discounts. But you can also engage in these classes when you travel. 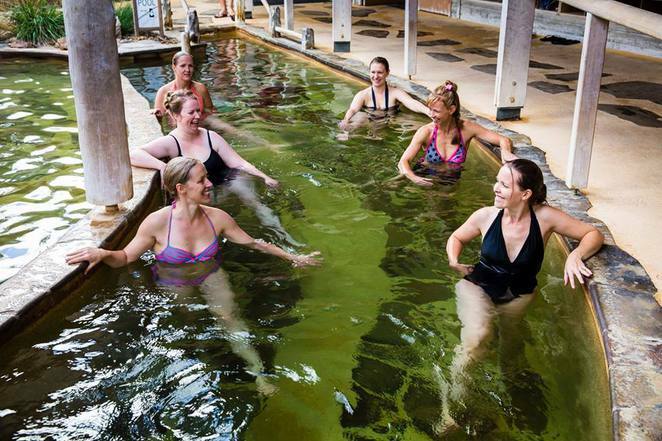 Everyone loves the Mornington Peninsula Hot Springs but a little known fact is that they also run water exercise classes twice a week on Tuesdays and Thursdays. The classes are at 7.30 am and 9 am. I had heard that these little known classes get quite heavily booked so I got there, as suggested, 30 minutes early for the 9am class. To be honest the lovely instructor was in the women's change room spruiking customers. So I don't think this is always the case. There were four of us in her class. Like most such classes we started out moving through the water walking and sometimes working up to a gentle jog. A few minutes into the class some cheery women from Hong Kong were watching us from the steps and Jodie, our instructor beckoned them in. These lovely women, without a word of English, were all beaming smiles and chuckles. There just seems a world-wide ability of people to have fun in water. When they did latch onto the words "up, down" they were very proud of themselves and proceeded to chorus the words with the instructor every time they were uttered. With a few thumbs up from the rest of us. The class went for 45 minute and we moved through a series of exercises using noodles to balance and cycle in the pool (always cause for hilarity), stretching muscles, tucking in tummies and straightening backs. The strange thing is that while we were active everyone else in the neighbouring pools were so totally still, with their backs to the pool walls soaking up the glory of the hot artisan waters. Therefore we did feel a bit on display as we laughed, giggled and rode tubes as if they were horses. But all those people looked so much like frogs on the edge of the pool with their wide eyes staring, that this quite added to the hilarity of the situation. The class ended with a wonderful meditative sequence of gliding our arms through the water with eyes closed. The great thing about water exercise is that your body is buoyed by the water so everything seems effortless. It is great for muscle strengthening. While everyone benefits it is also particularly good for those in need of rehabilitation such as those with muscle or joint injuries or limited mobility. The classes at the Hot Springs are complimentary and included in your entry. After the class no one moved. The thermal spa waters are magic, especially on a cool day. The benefits of staying in and chatting far outweigh the few seconds of cold air while one navigates to where one has left one's warm robe. The Hot Springs is such a tourist hot spot that it attracts a host of travellers from all over Australia and the world. The conversations turned to other hot springs whilst travelling. I had visited the ones at Mooree in northern NSW but learnt they had recently undergone a 7 million dollar redevelopment. One of the fellow class mates also told me about the free outdoor ones at Lightening Ridge where you can soak looking up at the desert stars. The Peninsula Hot Springs is also just about to develop a new hot springs complex in New Zealand. If they do it as beautifully as they have done the one on the Peninsula it should be well worth a visit. A fellow class mates also told me about the hot mud baths in Fiji. That is certainly one for the list. Over the summer months the Peninsula Springs also run a morning yoga class. As all classes are included in the price of admission some people make the most of it. You can do a yoga class, spend time in the gorgeous hot pools and then finish up with the water exercise class. The prices is $15 for seniors or concession and $20 full. There is something very relaxing about eating breakfast when everyone is in their bathrobes. Afterwards I had breakfast in the restaurant in the bathhouse complex. 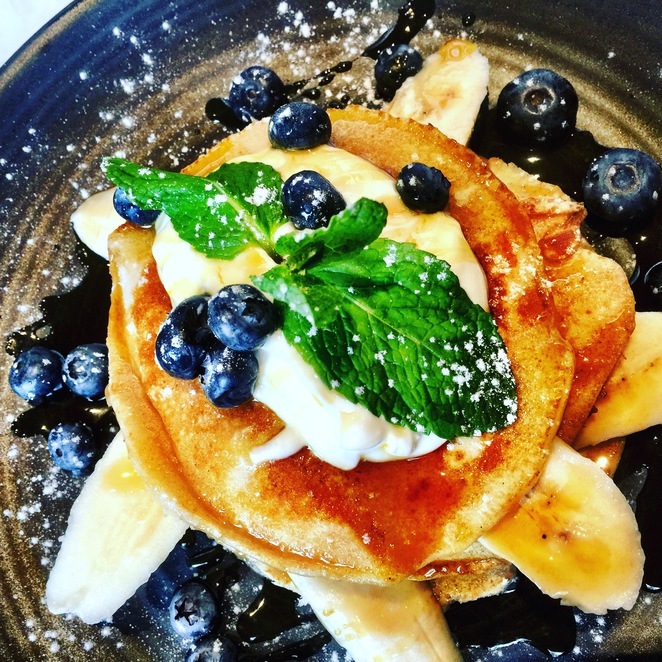 There is something incredibly relaxing about sitting around with a whole lot of people in white fluffy bathing robes that puts a whole new relaxing spin on the first meal of the day. So, warm water exercise, a soak, chat and breakfast in your robe. Something to put on your itinerary next time you are on the Mornington Peninsula. If you are interested in finding out about other hot springs in Australia. Click Linda Moon's article here. When: Tuesday and Thursday 7.30am and 9am. I have never been to the Peninsulal Hot Springs but it certainlylooks worth the trip. This is something I definitely have to try! Thank you for your vote of confidence. I am delighted that you found it playful and informative. As that is exactly what I was trying to convey. The hot springs on the Mornington Peninsula have it all over the ones at Hepburn Springs/Daylesford as there are heaps of outside pools spread over a huge area in a natural bush setting. The most gorgeous time to go is at night. Hope you get there some day with your friends. And thank you again for your kind comment. Congratulations of winning second prize in this month's competition. Glad my vote counted, this was a playful and informative article - thank you! Didn't know about these springs and will let my local friends know. I am a huge fan of Moree but also enjoyed Daylesford and Katherine hot springs.